Over the weekend, we went to 3 birthday parties. Not cool adult parties with vintage wine and civilized cheese platters… kid parties. When I was a kid, birthday parties consisted of a small group of children, usually at our house, with parent supervised games and a Carvel cake. Nowadays, you have to sign waivers just to let your kid play in one of those crazy bouncy houses. The amount of doughy pizza I consumed this weekend was just ridiculous. In a good way. All that warm sauce and bubbly cheese… Then, of course, there was plenty of dessert to cleanse the palate; ice cream cake, regular cake (adorned with red #5 frosting) and cookie platters. You know those soft-baked chocolate chip cookies they sell at Costco? My cousin made it for her son’s birthday (hi Maia!) and I haven’t stopped thinking about it ever since (you know it’s good when you can scarf it down out of a red Solo cup). Her salad was very simple: orzo, tomatoes, feta and mint. All I need is a lime tree and I can have my own personal mojito set-up. Anyway, to make this salad you need chilled orzo pasta. If it’s too hot, it will wilt the herbs and soften the tomatoes. Luckily, you can make the pasta in advance and just assemble when ready. But if you’re cooking to order, chill the pasta on a plate or tray until it cools down. Toss with a bit of olive oil so that it doesn’t stick. And while that’s going, chop up some tomatoes and make the salad dressing. I combine Dijon mustard, balsamic, and olive oil in an empty jam jar and shake it up. I love this method because it’s easy and keeps conveniently in the fridge. The mustard acts as an instant thickener too. You’ll have dressing for the rest of the week. Once your orzo has cooled, toss everything together with lots of thinly sliced mint, basil, and fresh mozzarella. The juices from the tomatoes will drink in all of the lovely, herb flavors. And go heavy on the herbs- it’s the best part. I’m almost finished with my flat of micro basil… (sniff, sniff). This salad travels well and feeds a crowd. * You will have extra vinaigrette leftover. Store in the fridge and use for salads during the week. Bring a medium-sized pot of water to a boil and add the pasta. Season with a pinch of salt and cook according to the package instructions. Drain in a colander, and spread out onto a large plate or tray. Drizzle with olive oil to prevent sticking. Place in the fridge to cool down. Meanwhile, make the vinaigrette. In an empty jam jar, add the mustard, balsamic vinegar and olive oil. Season generously with salt and pepper. Screw the lid on tight, and give it a shake. Slice your cherry tomatoes in half or quarter them if they're large. Thinly slice the celery, including the leafy tops if you have any. They will add great flavor to the salad. 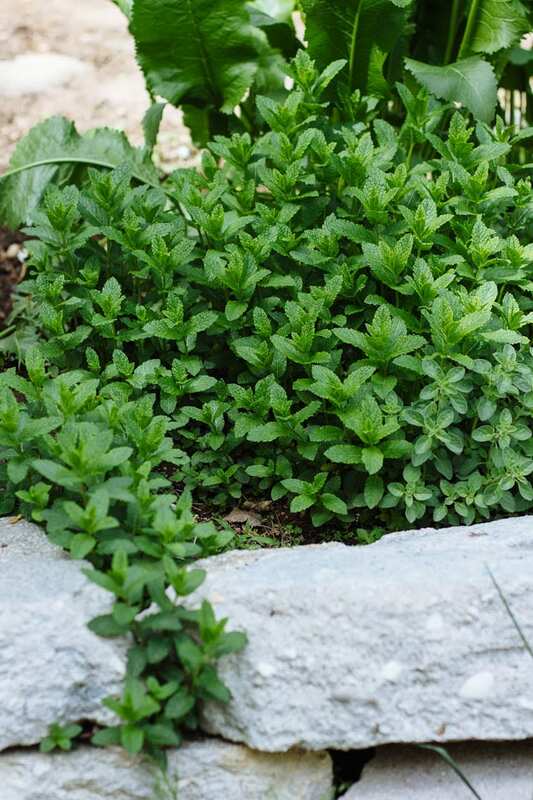 For the mint, stack the leaves (like a pile of paper) and roll them up (like a sleeping bag). Then, slice across into ribbons. Do the same with the basil leaves. 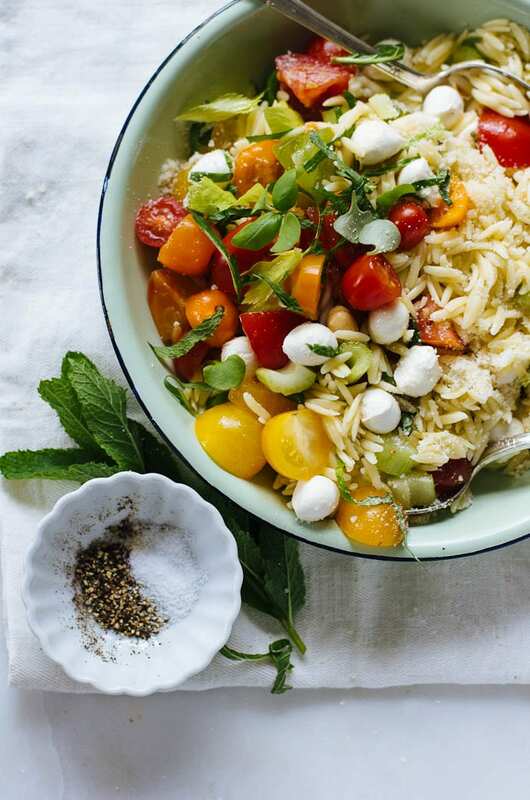 Grab a large bowl and add your cooled orzo, tomatoes, celery, mint, basil and mozzarella balls. Drizzle with some of the vinaigrette and toss well. Taste your salad, and adjust with extra seasoning or vinaigrette, if necessary. Previous Post: « chocolate chip granola bars + a trip for two! This looks so amzing! Orzo is one of my favorites, can’t wait to make this recipe this summer! Hi Sarah! Thank you kindly :) This is definitely a good one for summer (no mayo!) and you can throw in/take out whatever you want. It’s all about using what’s fresh and in season, and of course, what you like. Have fun with the recipe! I was thinking about making this for my daughter’s first birthday party we’re having at the park. Do you think I could make this the night before and it would still be good? That’s a great question! You can definitely make this ahead of time, with some exceptions. I adore orzo salad and yours looks absolutely delicious! Beautiful photos too. Do I see chickpeas in your version? Wow such vibrant photos. They just jump out and say ‘eat me!’ I know what you mean eating too many carbs at parties. but I guess that’s why they call it a party. 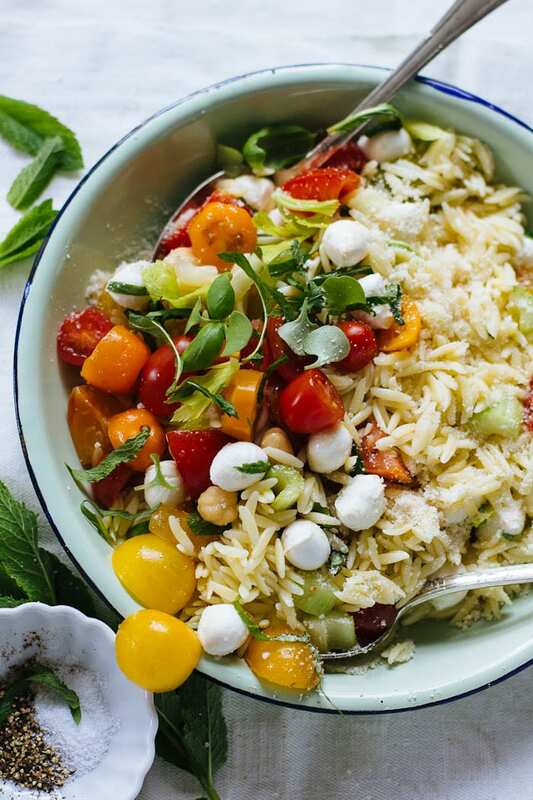 This orzo salad looks like a great recipe to bring to the hopefully many outdoor summer parties to come. I would definitely love to be sitting alongside this at a picnic! So delicious! Let’s start with the photo… I can’t make this salad fast enough. The recipe is so simple, yet it mixes different flavors and textures in a way I wouldn’t have thought of. That is the wonder of you Emilie and The Clever Carrot. I cannot wait for your cookbook! Enjoy your holiday weekend and PLEASE share the details of anything you cook. Oh how I want to make this now! I shouldn’t stare at some amazingness without having lunch first. I can’t wait to make this this Memorial Day weekend!!! Great recipe! Lovin the colors in that salad! I love orzo, this salad is absolutely gorgeous! This looks delicious. Roll on summer so I can use the tomatoes from the garden for this. Every summer I seem to get stuck on one salad that we eat again and again. Looks like 2015 may be the year of the Orzo salad. oh my goodness, looks delicious!!!! I just happened upon your blog and I’m so glad, I love your style. A lovely presentation! For the gluten free people in our lives, we’ll experiment on this with some different rice possibilities or maybe some lentils – keeping the factor of the base flavour in mind. White pepper is also one of our favourites and allows for a little less intrusiveness too. Hello! Welcome! A gluten-free version of this would be outstanding. Perhaps a little quinoa, millet, or as you’ve suggested using different rice combinations. I haven’t used white pepper in ages- thanks for the reminder. I know it’s in my spice cabinet somewhere… Have fun with the recipe and thanks for stopping by! Enjoy! just made this last night, minus the feta and mustard, with mozzarella instead….. 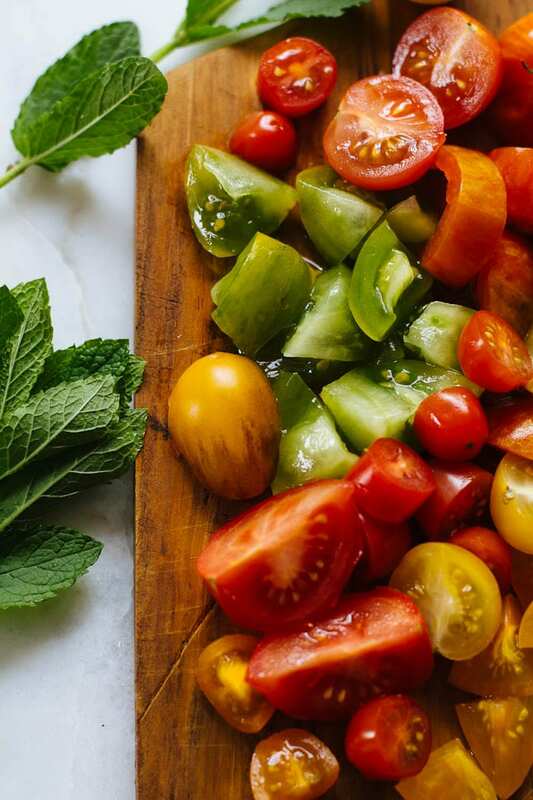 The mint was such a refreshing burst of flavor to my usual caprese salads! Thanks for the inspiration! This looks amazing! Everything looks so fresh. I love this salad! It’s very healthy. And you have a good-looking mint. I will definitely add this in my list :) Thanks for sharing! Took the salad to a dinner party and was enjoyed by all. I am not a fan of mint so omitted and added additional basil along with some grilled zucchini. This is will be wonderful to have throughout the summer and is a great substitute for a pasta salad.